Clyde made an ideal start to their new campaign with victory over League 2 rivals Annan Athletic in Saturday’s Betfred Cup opener. Goals from debutant Jack Breslin and David Goodwillie were enough to get new boss Jim Chapman’s reign off to a winning start against his old club, despite a late surge from the away side. When the Betfred Cup draw was made it was a strange coincidence that manager Chapman would face his former club for his first competitive match in charge. Even stranger when the Clyde boss signed four of their ex-players within 24 hours of kick-off, adding to several others already in his squad. Clyde came out of the traps quicker in the wet and blustery conditions but were soon on the back foot, setting the tone for the remainder of the half. Annan’s Moxon Owen should have done better when he headed over. The lively Aidan Smith drew a foul at the edge of the box, with his subsequent free-kick just inches away. The closest Clyde came in the first half was through Darren Miller’s corner, which was heading straight in until goalkeeper Jim Atkinson palmed it away. After the break Chapman’s men controlled the majority of the play with captain Barry Cuddihy’s deflected effort just missing the target shortly before the hour mark. However, from the resulting corner Clyde were ahead. David Gormley nodded towards goal forcing a great reaction save from Atkinson. But the visiting keeper was left helpless when Breslin’s looping header crept inside the post from the rebound. After making the breakthrough Clyde then gained in confidence with Goodwillie, Gormley and Miller combining well down the right. Smart Osadolor, another former Annan player, was then introduced to a series of boos from the away supporters. He created space on the same side in the final minute before sending Goodwillie through on goal and he remained composed to knock the ball past the onrushing keeper. 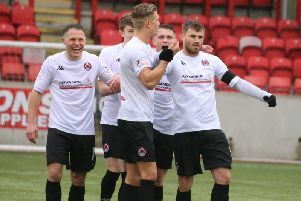 A late flurry from Annan saw them reduce the deficit in injury-time through Steven Swinglehurst following a corner, but Clyde held on to take all three points. Afterwards Chapman said he was pleased with the victory and that his players had set a “benchmark” with their victory over his previous employers. Clyde made eight signings within 24 hours of kick-off, adding to several more made in the weeks before. Former Annan midfielders Cuddihy and Darren Ramsay were snapped up on Friday and were quickly followed by their former Galabank team-mate Osadolor and forward Mark Burbidge from Clydebank Juniors. Chapman has also brought in four further players who have joined the club on amateur terms. Defender Callum Home (24) and midfielders Jordan Brown (19) and Pinio Dachnowicz (18) are also ex-Annan players while defender Lewis Wilson (20) was formerly with Alloa Athletic. However Chapman was quick to say this is not a sign that the club’s business is done for the season. He said: “All the players know that that’s the start and anybody that starts to drop off ... fine, bye-bye. “We are now searching for better than what we have in the dressing room. “These guys have set a good benchmark and anybody that does come in has to be better than that now. On the match, Chapman was pleased his side improved after the half-time team talk, stressing that the result is the most important thing. He said: “I challenged them just to win the game.How you win football matches doesn’t matter.